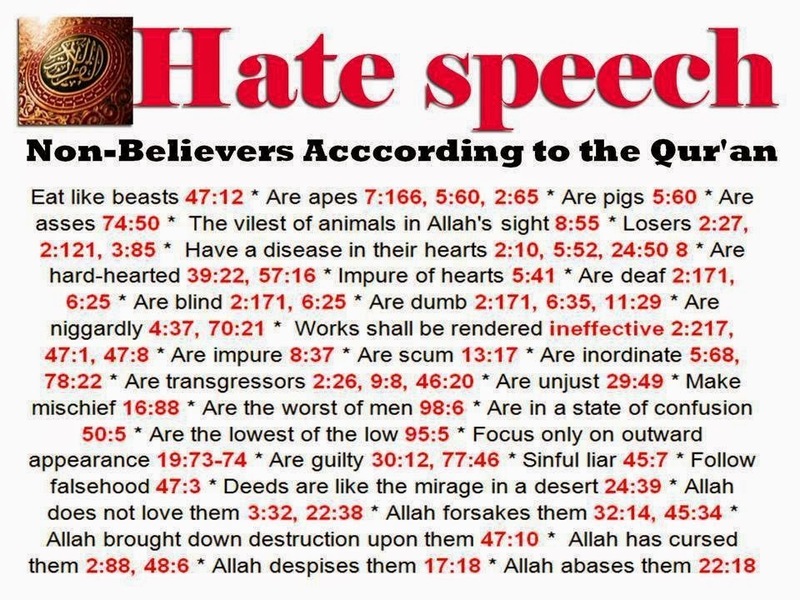 And if you don't believe this just watch TV to see how women are treated as animals, raped, Christians are killed and triple taxed (if they are lucky), How the Koran teaches that those who believe that God had a Son and His Son is Divine will spend eternity in the fires of hell versus the garden of Paradise. Let;s face it, Islam and Christianity are mutually exclusive in that they are not compatible. And it angers me to see these Muslims on campus peddling Islam as thought Their God accepts Jews, Christians and all faiths - Bull Crap Lies, lies and more lies - For goodness sake read the news and see how infidels are treated in countries governed by Islam! Don't believe the lie that Islam accepts Jews, Christians homosexuals - hell you can't even drink in a country under Islamic rule. Homosexuals are beheaded and eating pork is a capital crime and converting to Christianity will get you 1,000 lashes --- Again don't take my word for it read the news and Google these issues. Islam was started in the 9th century and violently conquered North Africa, the Middle East, and Parts of Central and Western Europe until the Pope launched a defensive action against the Muslim Invaders - the Crusades. Though the Catholic Church was not perfect in the way she handled the Crusades - none the less they were in response to the 21 million persons killed by Mohammed in his conquest of the world. This desire for world conquest has been going on through today. In fact the US Marines were formed to protect shipping in the 18th century from Muslim Pirates off of Tripoli who were attaching merchant vessels and killing and robbing the cargo for their 7 virgins by cutting the throats of the sailors. This is how the Marines go the name the "Leather Necks" for they were a leather band around their neck to prevent the Muslims from getting their 7 virgins. So as you can see the Muslims have been a thorn in the side of the world since their inception. Read more about the desire for world conquest by these Muslims and how it lines up with the Book of Revelation.